Nick Showers-Glover, an inmate at Spring Creek Correctional Center, walked past shelves of coffee, creamers, and candy to a couple of well-stocked freezers inside the prison’s store. “We sell the single pizzas, which are $1.30, Hot Pockets for a $1,” he said. The freezers are filled with everything from single frozen burritos to whole ham slabs. Stuff that can be cooked in a microwave, even if it takes a while. He moved on to the shelves lined with hygiene products, such as deodorant, toothpaste, and shampoo. 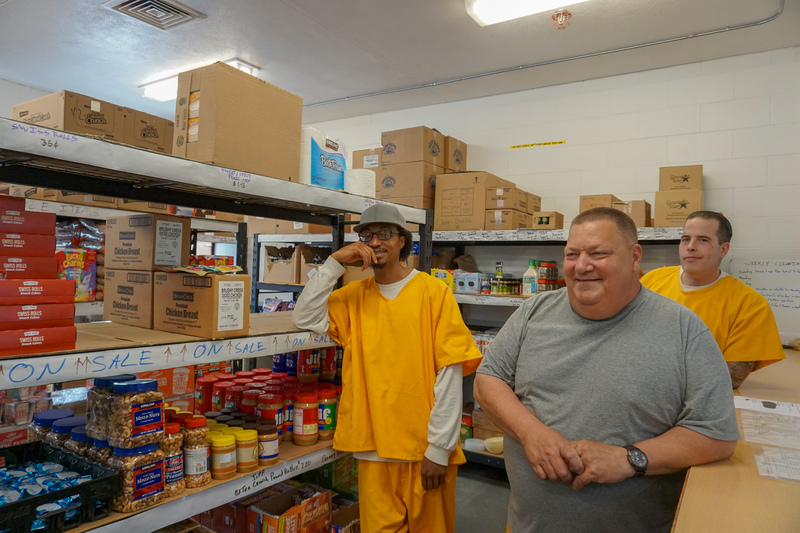 Like stores outside of prisons, they offer a variety to fit everyone’s needs. Cheap bars of soap are 70 cents but Dove runs a $1.25. Spring Creek’s store is owned and operated by the prisoners. They choose what to sell and what to charge. It’s set up as a co-op and different inmate-run organizations, like the Barbell Club and the Alaska Native Culture Club, each has a share in the profits. Spring Creek superintendent Bill Lapinskas said when the prison opened 30 years ago, it was set up differently. Money spent at the store didn’t stay in the prison, and inmates couldn’t see the benefits of protecting the resource. 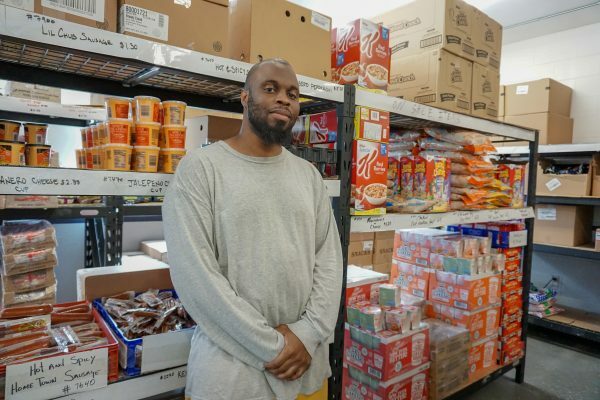 But for the past three years, all of the profits from the store have been reinvested in the prison to buy things like equipment for the gym and hobby shop and microwaves for the housing areas. Inmates vote to donate some of the funds to charities outside of the prison, too. Items in the store come from Keefe Group, a private company that sells specialty products for prison commissaries across the country. According to the Prison Policy Initiative, prison commissaries are a $1.6 billion per year industry. In some facilities, the for-profit companies directly operate the commissaries and reap all of the profits. In others, the state runs the store. In Seward, the store manager buys from the company in bulk, marks up the prices a little bit, and the profits stay in the institution. The model is very unique. Store manager Randy McDaniel said they want to make money, but they also want to help out their fellow inmates. They also want to provide things that make people feel good, like Lucky Charms, nacho chips, and hamburger patties. McDaniel said the shelves are filled with things people request, not just what he wants, and people get excited to have access to soda and sausages. Inmates celebrate accomplishments, like passing tests for the GED, by sharing high-end items such as chicken wings. They make state-provided meals more palatable by purchasing hot sauce and spices. “It feels good to treat people, you know?” McDaniel said. Showers-Glover, who’s been in prison for about a decade, said it also feels good to be treated like an adult who can be responsible for buying his own things. The store sells clothing and shoes that are nicer than what the state provides and that have not been worn by other inmates. He said people take good care of the things they buy for themselves or are gifts from their families through the prison store. They take pride in them, just like the prison community now takes pride in the store. Next week we’ll be talking about prison clubs that provide opportunities for education and recreation. Want to make sure you don’t miss it and other Solutions Desk stories? Subscribe to the podcast on iTunes, Stitcher, Google Play, or NPR.